With recent statistics 1 showing that more Americans are graduating from college now than ever before, there is surprisingly little talk about trade schools and the long-term benefits and opportunities that they present. 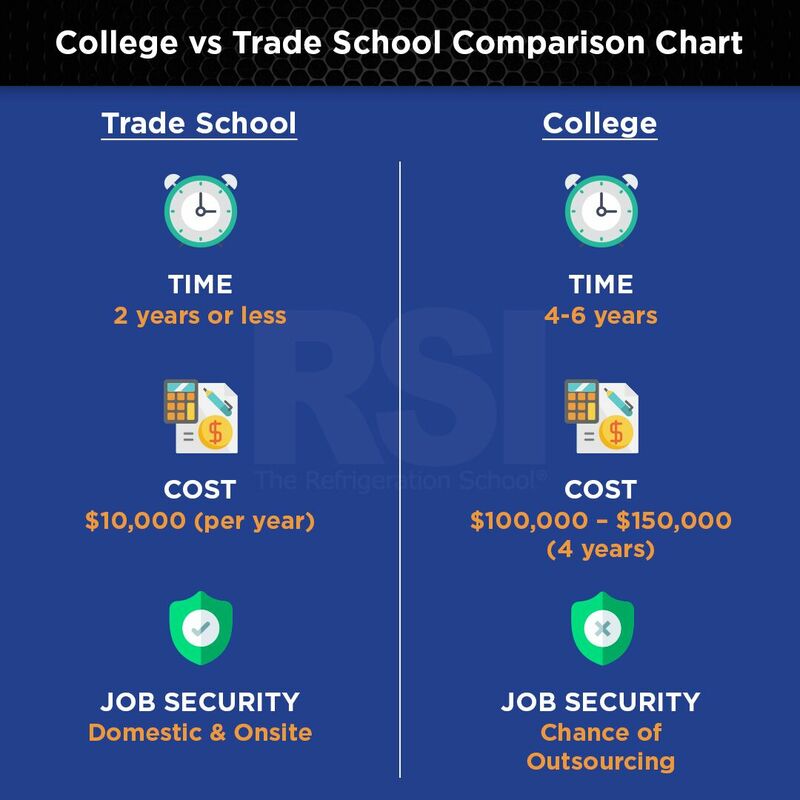 Before choosing to study at a four-year university, consider all the pros and cons of choosing a trade school over a traditional university. Spending four years in college can give a student a great feeling of accomplishment, and a degree from a respected university often comes with a certain amount of prestige. On the other hand, four intense years in school can be difficult to complete. According to the National Center for Education Statistics, 60% of students 2 need six years to finish a bachelor’s degree program. What’s more, more than half of public university students drop out before graduating 3, and never finish at all. 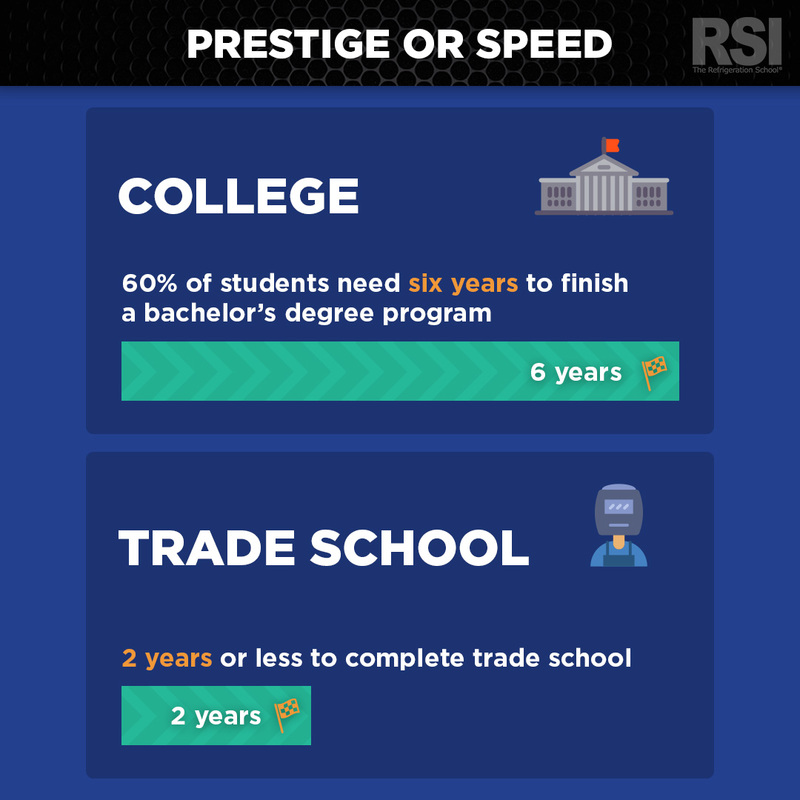 Two years or less 4 at a trade school may be far more manageable and appealing to students who have just completed their high school education. According to the U.S. Department of Education, the average cost 5 of attending a university for four years is more than $100,000, and this price tag can increase dramatically, sometimes over $150,000, if a private college is chosen. 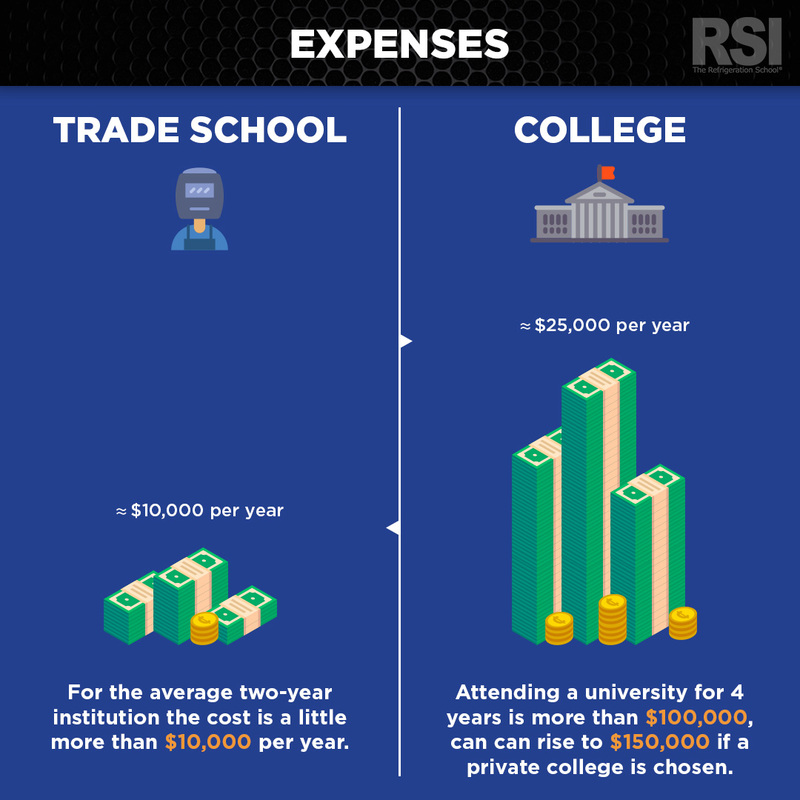 For the average two-year institution, which includes many trade schools and certificate programs, the cost is a little more than $10,000 per year. The extra expense of a bachelor’s degree often comes with more choices in terms of subjects to study, and you will also have the potential to continue your education and get advanced degrees in the future. Trade schools may have fewer options, but the price tag is often more manageable, and if loans are used to pay for school, students will graduate with far less debt. According to the Bureau of Labor Statistics, the mean annual wage 6 for a qualified electrician is $55,590 nationally, and in certain industries can go as high as $88,130. The salaries are slightly less for heating, air conditioning, and refrigeration mechanics with their mean annual wage 7 of $47,380, but some earn as much as $71,690. Some blue-collar workers can command upwards of $100,000 8 for their skills. In comparison, the average starting salary 9 for someone with a bachelor’s degree is $50,651. Salaries vary with the type of degree. While individuals with a bachelor’s degree in English take home a mean annual wage of $34,702, those holding engineering degrees earn a mean annual wage of $61,819. Of course, doctors can make more than $180,000 a year 10, but they typically spend 15 years in college and residency programs. This means more than just a growing demand for skilled technicians, it means that the skills learned in a trade school are impossible to sell overseas. For example, electricians and HVAC/R technicians might never lose their jobs to a call center in another country—their work must be done locally. On the flip side, their skills are universal and are needed all over the world, making it easy to find work no matter where you end up. Trade school students are out of school sooner and with less debt. This means that they are working sooner and paying their smaller loans off faster. If you add in the extra cost of student loan interest over time, the savings are even greater for those who chose trade schools. College graduates who are the best in their fields can end up with greater long-term income potential than trade school graduates. However, the majority of students end up right in the middle. Once all the considerations have been made, that middle is not that much higher than a qualified, trained tradesman. 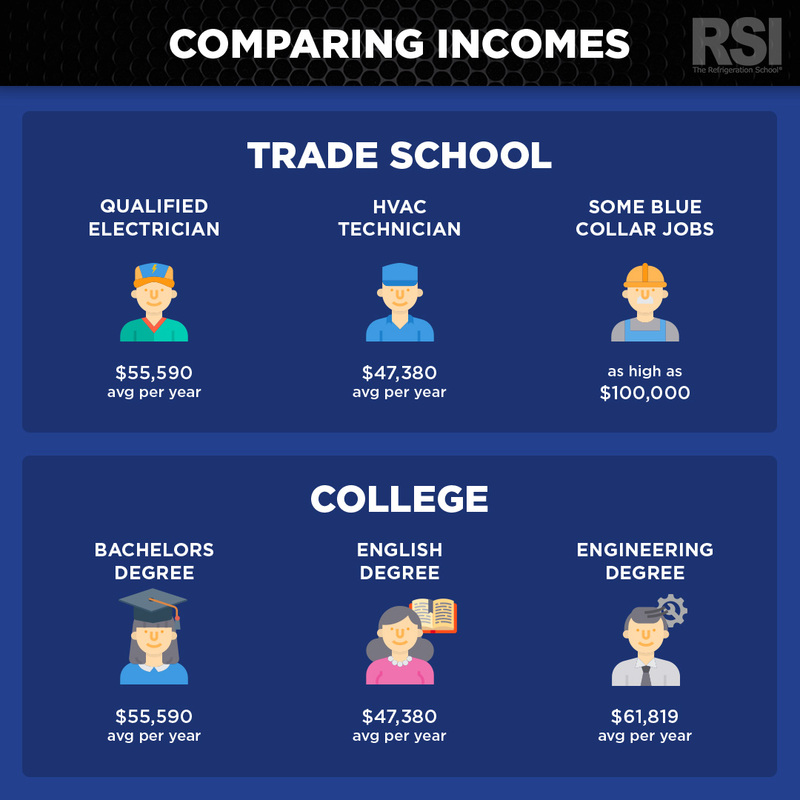 While the potential for more income may be higher for college graduates, the time spent in trade school is shorter, it is more affordable, and trade schools leave their graduates on solid ground and ready to begin a rewarding career.